This Halloween I celebrate my 17th year as a tattooist, and can think of nothing better to commemorate these years then seeing my friend and client Mindy on the cover of Tattoo Magazine! She has been getting work from me for the entire span of my career, and is one of the first ladies to get a floral form bodyset which I am known for. Her collection helped pave the way for others to follow by inspiring such a beautiful look on such a lovely lady. Mindy is part of the Bloom Project, which started with a desire from me to see a more unified and flowing female esthetic in tattooing. In addition to the use of soft, feminine imagery in my work, I've always emphasized laying the tattooing out on the body in a way that is balanced like a nice garment- rather than thinking in terms of bodysuits, I've come to think of the collections I put on my clients as "bodysets". Many of these sets began with shoulder cap coverage gradually becoming full sleeves and beyond. I have been documenting this process, and the Bloom Project is a direct result of passion, dedication and a desire to push the evolution of this project further. This has resulted in a core clientele who are all representives of the Bloom Project. 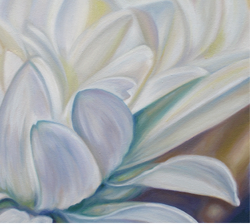 I chose this title as many of my clients request floral motifs from me, and I've found that the process of unfolding through layers of ink, adding on over time, and the personal transformation that occurs, can be likened to the process of a flower bloom opening. We are all in a state of becoming and growing from our experiences. I have a great appreciation for the beauty and wonder of Nature which I believe we are all a part of. From my clients to my artistry, this is the energy that we synchonise with and resonate from. Check out some updates in the Bodyset gallery, and check back soon as I continue to update MicheleWortman.com. I have added some more Video portraits featuring the ladies of the Bloom Project. 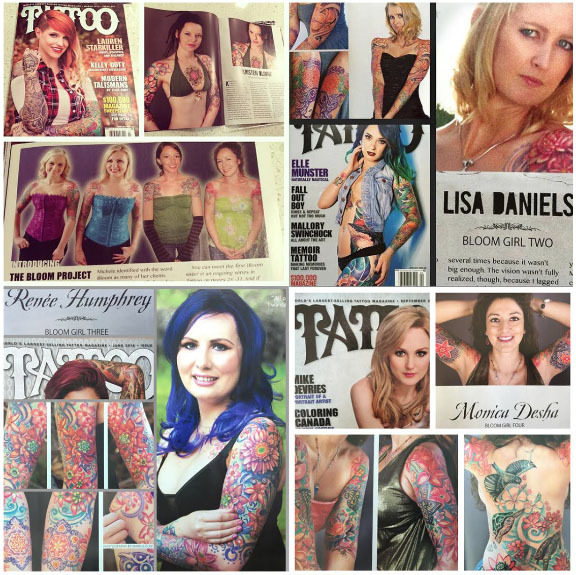 There is also a copy of Mindy's current spread in Tattoo Magazine posted in my Press gallery. Drop by the site and take a look. Give a follow on the Facebook Bloom page and at Michele Wortman, where I post updates on the Project and art related news as well.